On Saturday, August 19 and Sunday, August 20, Oakland’s magnetic Art + Soul festival celebrates local spirit, style, creativity and pride. 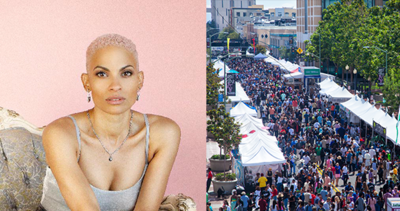 The festival kicks off Saturday with Oakland artists Goapele, Los Rakas, and Adrian Marcel, and continues Sunday with festival favorite Angie Stone and rising star Sydney Nycole. Festival goers will also enjoy the popular artisan marketplace, world/urban dance stage featuring some of the hottest urban and ethnic dance troupes, a must-see Turf Dance Battle, food booths, a huge Family Fun Zone with rides and interactive arts, the standing-room-only Kinetic Arts Circus Stage and an interactive public mural painting project. Centered in Frank H. Ogawa Plaza and encompassing 10 strollable city blocks, Art + Soul runs from noon to 6 p.m. Oakland’s festival calendar is full in August, with the Umoja Festival and Pan-Africa Soccer Tournament, The Town’s Half Marathon, the Oakland Triathalon, and the Oakland Chinatown StreetFest all happening this month! For more information, contact Marketing Coordinator Harry Hamilton. Oakland songwriter Goapele performs at Art + Soul on Saturday, August 19. Local Vs. Online Retailing: What’s Happening in Oakland? The retail industry is changing, affecting both our neighborhoods and how we buy our daily goods. City of Oakland’s Retail Specialist Keira Williams was recently interviewed on KQED to report on how Oakland retailers are faring. While traditional shopping malls have struggled more against online retail, Oakland’s neighborhood shopping districts, like Rockridge and Fruitvale, are still doing well. In fact, in commercial corridors in Oakland with an established business improvement district, sales tax revenue grew by 1.6 percent from 2015 to 2016, faster than the rest of the city. For more information on how to make your retail business succeed in Oakland, contact Retail Specialist Keira Williams. Oakland’s local sewing industry is directly producing clothing sold at some of our most innovative retail boutiques—both brick and mortar and online. 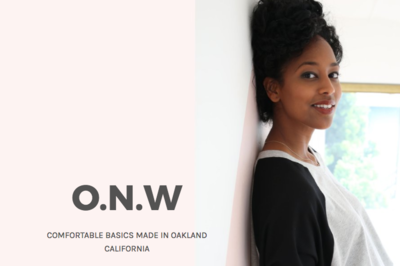 OwlNWood, KaliMade, Lesley Evers, and Kosa are all offering locally-made clothing lines that are both designed and produced in Oakland. At Calculated Clothing, you can see the end-to-end manufacturing process at their in-house design studio. Many local clothing manufacturers got a boost from Kiva Oakland to finance their lines. For more information on resources for both local retail and manufacturing, contact the Oakland Business Assistance Center. 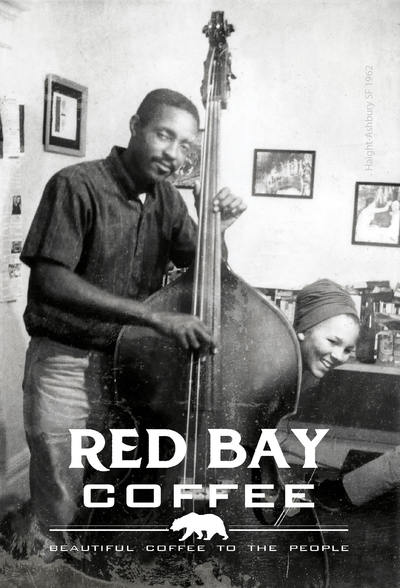 Did you know that the number of Black-owned firms in Oakland grew by 50% from 2007 to 2012? The Black Arts Movement and Business District, which covers the 14th Street corridor from Lake Merritt to downtown, includes over 20 Black-owned businesses, including newcomers Benny Adam Grooming Parlor, 310 Gallery, and Indie Award winner Town Biz, which carries goods by Oakland-based artisans. Many more are listed in a new online directory by BAOBOB, the Bay Area Organization of Black Owned Businesses. On August 17-19, the California State Black Chamber of Commerce will also host its annual conference in Oakland. For more information on Oakland demographics and business growth, contact Marisa Raya. How do investors find underexposed real estate development opportunities in Oakland? The City of Oakland has partnered with OppSites, a local firm with an online real estate platform, to help attract investment to development priorities in Oakland that might otherwise go unnoticed. You can view more than 100 Oakland sites currently listed here. Many of these sites, including properties that are vacant, underused, or may be appropriate for adaptive reuse, were identified in neighborhood planning processes as top priorities to implement community goals. If you own a property that you would like added to OppSites or are interested in learning more about any of the sites currently listed, contact Economic Development Specialist Zach Seal. In April 2016, OakDOT made changes to the layout of Telegraph Avenue between 20th Street and 29th Street in the Koreatown-Northgate (KONO) District, including crosswalks, bike lanes, and the removal of one traffic lane. Perhaps best known for First Fridays, the KONO area is home to art galleries, restaurants, bars, and neighborhood retail and services. As a result of the new street design, the area has had no pedestrian crosswalk collisions reported for the first time in five years. Another trend in the right direction: a 78% increase in people biking and a 100% increase in people walking during peak hours. The KONO District has seen a 9% increase in retail sales and the addition of five new businesses since the completion of the Telegraph Avenue project. 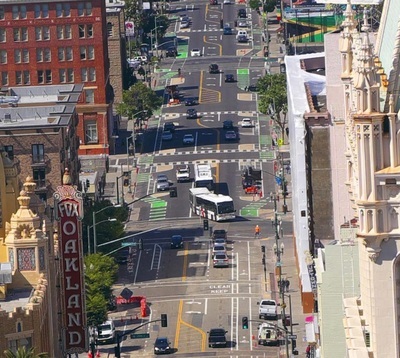 For more information, read OakDOT’s Telegraph Avenue Progress Report. Aug 4 @ Telegraph Ave.
Can Chinese developer bring $565 million megaproject to an Oakland BART station?